Luxury Real Estate Marketing: What Is Your Brand Worth? Choosing the right brand name is extremely important for luxury real estate marketing professionals. Some of the best brand names deliver an emotional impact that makes it easy to remember and also propels sales. Striking just the right chord with your target market is the key. What emotions are summoned with the name Shark Tank? Have you ever watched Shark Tank, the TV reality show on ABC? It stars Barbara Corcoran, the luxury real estate marketing professional who sold her highly successful brokerage firm in New York several years ago, and other successful venture capital superstars including billionaire Mark Cuban, the owner of the Dallas Mavericks. 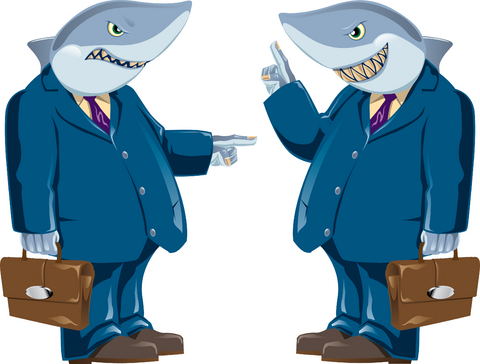 The premise of the show is that entrepreneurs seeking venture capital give their pitch to a panel of investors who fight, like sharks, over who will offer the best deal. On a recent episode, a couple of guys pitched the idea of investing $50,000 in their clothing business in exchange for a 25% interest in the company which is called Hill Billy™. Comedian Jeff Foxworthy (one of the sharks) immediately recognized the value of the Hill Billy brand name because he has made a fortune with his “red neck” humor and Blue Color TV. The entrepreneurs, who trademarked the name, proved that there is a market for Hill Billy™ brand clothes by selling them at country music concerts and often outselling the performers T-shirts and concert paraphernalia. But, none of the sharks took the bait. Instead, they all insisted that the true value of the company was in the trademarked brand itself, asserting that the clothing business is extremely risky. They did see value in the brand name, but only in its limitless licensing potential. Three of the sharks agreed to offer $25,000 each to buy the Hill Billy™ brand name for licensing purposes and not to invest in the manufacturing of the clothing line. They also offered to give the entrepreneurs a 7% royalty on all licensing fees. The deal was accepted. The term Hill Billy refers to people in the United States who dwell in remote, rural mountainous areas, such as Appalachia, or the Ozarks. It sometimes has a derogatory connotation depending on the context of its use or the attitude of person using of the word. But, all of this meaning plus the values that are inferred are wrapped up in the brand name. The brand obviously offers a form of self-expression for certain consumers who can identify with it whether or not it is taken seriously. The Hill Billy™ brand clearly strikes the right emotional chord with its target market that drives sales. That is exactly what makes it a valuable brand. How much is your brand name worth?